Hong Kong, a special administrative region of the People’s Republic of China, has been known as one of the most expensive cities in the world. Statistics from Numbeo reveal that, the price per square meter to buy an apartment in City Center is about 23,762.89 US dollars; even if an apartment is outside of the City Center, the price per square meter can be also as high as 15,051 US dollars. 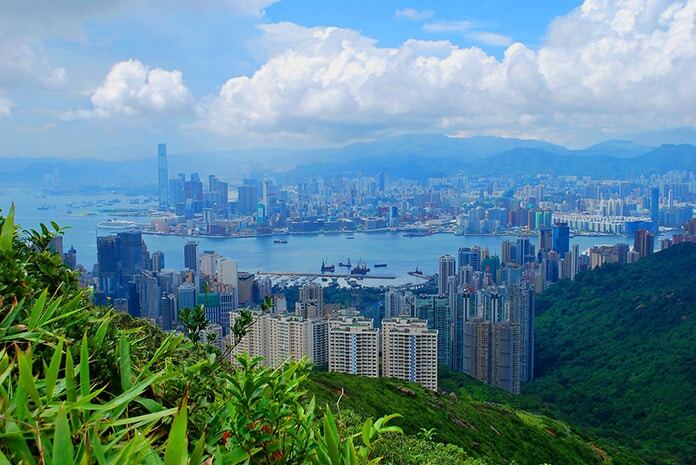 So, land is MORE precious than gold in Hong Kong. It can be said that it’s unrealistic to free up much space to construct a solar power farm, especially a large-scale one. 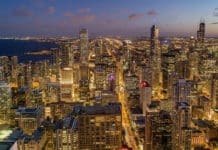 In general, most officials would prefer a skyscraper or public housing for low-income citizens. 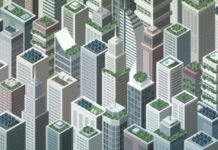 On the other hand, energy is regarded as the engine of the development of a city – it’s not easy for the government to balance the relationship between renewables and economic efficiency in this new era. Even so, as the charm of renewables has been obtained in-depth experience by many citizens, and advances have been achieved in the technical fields, more and more renewable power farms with good economic results are gradually appearing in this “gold city”. 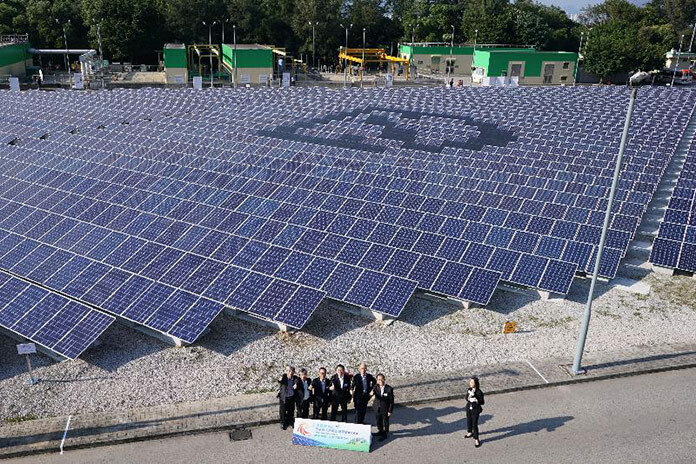 Recently the largest solar power farm, located at the Siu Ho Wan Water Treatment Works, was officially put into operation. This solar power farm, consists of 4,200 pieces of polycrystalline silicon photovoltaic modules, is expected to generate 1.1 million kWh of solar power per year. And in the meantime, it can help reduce annual carbon dioxide emissions by about 770 tons. To make this concrete-structured solar power farm more flexible, then profitable, engineers utilized concrete bases to install the photovoltaic panels, without attached devices used to fix the photovoltaic arrays to the ground. So the “farm” can be easy to relocate to a proper place for better sunlight absorption and power conversion. Additionally, many digital screens are installed next to the photovoltaic panels to display real-time data, which help better monitor and master the operation of the solar power farm. Mr Edwin TONG Ka-hung, Director of the Drainage Services Department (DSD), said that the Siu Ho Wan Water Treatment Works has been providing sewage treatment services for a total of around 200,000 citizens who are based in Chek Lap Kok Airport, Tung Chung, Discovery Bay and Hong Kong Disneyland. This solar power farm is sufficient to meet approximately a quarter of the power demand of the water treatment works – that equivalent to the annual power consumption of 230 households or a 30-storey residential building. 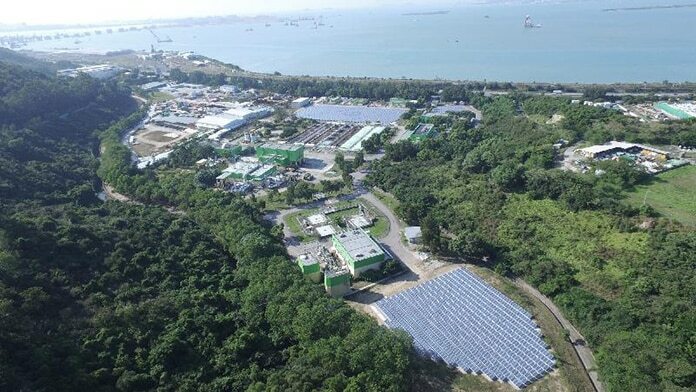 Edwin TONG also added that besides the project at the Siu Ho Wan Water Treatment Works, the DSD is planning to install small-scale solar photovoltaic systems in other 20 facilities, basing on their local conditions. As the one mentioned in this article, these solar photovoltaic systems are designed to satisfy a portion of the power demand of their corresponding facilities where they’re located. Since a large amount of biogas can be produced during the sewage treatment process, the DSD is considering actively making good use of this type of renewable energy. One of the approaches is to convert the biogas into electricity and thermal energy, aiming to reduce the dependence on traditional power supply. Edwin TONG also explained that the utilization of renewables like solar energy and biogas by the Department is generating considerable energy equivalent to 32 million kWh of power per year. This amount can satisfy one-tenth of the total energy demand of the sector. According to relevant statistics, the DSD has over 300 flood control and sewage treatment facilities, and is operating nearly 70 water treatment works. The total capacity of sewage treatment per year has reached 1 billion cubic meters, equivalent to the capacity of 400,000 standard swimming pools. Mr Wong Kam-sing, Secretary of the Environment Bureau, said in the opening ceremony of the solar power farm at the Siu Ho Wan Water Treatment Works that for combating climate change, the community must jointly practice the concept of “use less, waste less”, including energy and water conservation, green commuting and consumption. To achieve a low-carbon city, in addition to the promotion of energy saving and the use of natural gas for power generation, the Hong Kong government is actively exploring approaches to utilize different types of renewable energy. The integration between a renewable facility and an infrastructure facility, like a solar power farm and a water treatment works, can be a good way to convert waste into energy. Photovoltaic power generation is proven to be a right direction and also an ideal way for Hong Kong to develop renewable energy, worthy of more support from the government.